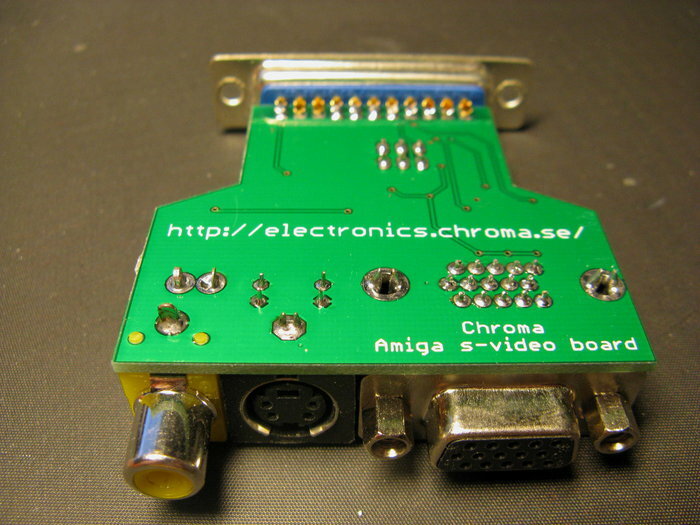 It's a board that connects to any Amigas 23pin RGB-connector. The board will give you s-video and composite out using an AD724 circuit. The picture quality on the boards composite signal might be a little bit better than that of the built in composite signal of the newer Amigas. But s-video is the big gain in quality. 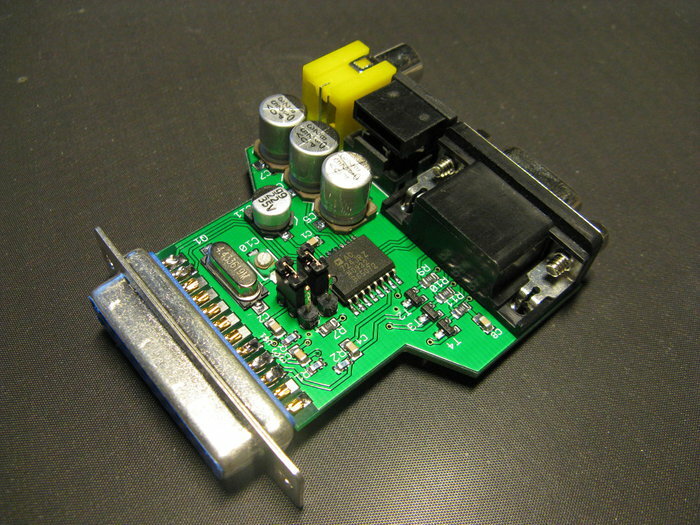 The board also has a VGA-connector, but there is no intelligence on the board in between the Amiga and the VGA-connector, in this case the board is just an adapter. However the RGB-signals are "buffered". Preferably always disconnect everything from the s-video board before disconnecting the s-video board from the Amiga. The board has a tiny adjustable capacitor in parallell with the PAL color crystal. If the colors are floating Use a tiny flat screwdriver to adjust the capacitor until the colors stop floating/waving. The board has two jumpers, One is for selecting PAL/NTSC on the AD724 (PAL default) and the other is for selecting clock source for color generation. In the default (PAL) setting the signal is taken from the onboard crystal. In the NTSC position it is taken from the Amiga. Basically: to switch to NTSC move both jumpers to the other position. $37 for a complete board. Postage to Sweden is $2, Europe $4, rest of the world $5.